Devoted to the Philosophy and Methods of Higher Attainment / A Mystical and Ethical Journal. Washington, D.C.. Editor: Joseph Stewart, LL.M. 1/1, December 1900. The first number is dated both November and December, but was succeeded by the issue of January 1901. 18-36 pp., $2.00-$1.50 a year. The journal "was devoted to the Philosophy and Methods of the Higher Attainment. It makes special features of Concentration and Psychic Science, and presents new and original matter as well as past research. It is scientific, Synthetic and constructive. Its excellence is attested by the opinions of leading thinkers and the esteem in which it is held." 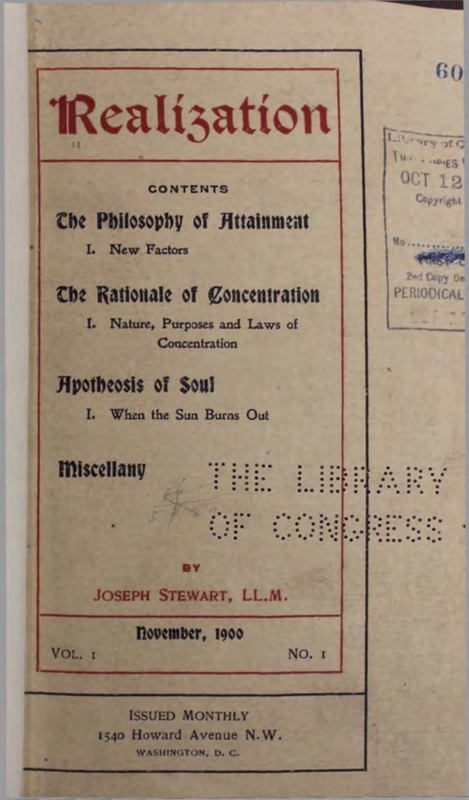 It consisted of "Special Treatises," "lessons and special studies by [Stewart] in the philosophy and methods of attainment, concentration, the Silence, Yoga, Psychic Science, and the general subject of Realization." These included Stewart's ideas on "Precognition," "Must We Grow Old and Die?" "Some Problems and Dangers of Telepathic Rapport," "Psychic Breathings," "Rapport with the Universal," "Raja Yoga," "Apotheosis of Soul," and the like. Stewart was a leading figure in INTA and wrote for Herald of the Golden Age, Evelyn Arthur See's Higher Thought, and Mind. Noted in Herbert N. Casson, The Crime of Credulity (New York: Peter Eckler, 1901), The Prophet, February 1901, Eltka, 1904, and the Religio-Philosophical Journal, 1905, and in the exchanges of The Mazdaznan, 1904. LOC.